A major reform for federal overtime pay rules was blocked by a Texas judge just before it was set to go into effect last week, handing a gift to the incoming Trump administration by allowing millions nationwide to work extra time without extra compensation. The Obama administration sought to adjust the eligibility threshold for overtime pay for low-income salaried workers, who have historically been exempt from the standard 50-percent wage premium for hours worked over the standard 40-hour week. Currently those earning as little as $23,660 annually—in the range of frontline fast food workers, well below the estimated living wage in California and New York—are ineligible for overtime. Essentially. they might end up working longer than their lower-ranked waged coworkers and be paid less per hour. Under the Labor Department’s new rule, salaried workers earning up to $47,476 a year, or about $900 a week, could earn additional overtime pay. But Federal District Judge Amos Mazzant struck down the measure. Although the reforms aim simply to update rules based on standard protections for those who work excess hours, the court concluded such regulatory changes should be based on types of work, rather than on levels of compensation, and should be addressed through Congress, not the Department of Labor, lest this effort to remedy years of shorting workers on their wages cause their industry “irreparable harm.” The Labor Department now plans to appeal the injunction, which effectively blocks an estimated $570 million in extra earnings in 2017. The guiding concept of “a fair day’s work for a fair day’s pay” in the Fair Labor Standards Act’s overtime provision was balancing time and wage value. By capping the standard workweek at 40 hours and setting a baseline wage, the government provided a regulatory framework to promote a healthy level of employment across the workforce, along with a foundation of economic security to protect individuals against getting overworked. Overtime penalizes bosses for making people work excessively by curbing the incentive to drive impoverished workers to exhaustion. But today, despite an era of soaring corporate profits, outdated overtime rules cover a smaller share of the workforce than they did in the 1970s. EPI estimates the reforms would benefit about 12.5 million workers, about a third of the workforce, based on estimates of workers who would no longer be exempt under the new guidelines or would qualify based on the income threshold. Workers in lower-wage states would get a particularly large boost: The expanded rule would cover fully 40 percent of Florida’s workers, for example, including perhaps some workers in President-elect Trump’s luxury resorts. A slight majority of those benefiting would be women, and the additional pay would increase the incomes of an estimated 11.5 parents and children. Those reforms would also disproportionately benefit blacks and Latinos, millennials (aged 18 to 34), and those who have completed a high-school degree or less formal education. The workers would be concentrated in historically precarious and non-union sectors, including farming, construction, and hospitality. If the Labor Department’s ongoing litigation fails to overturn the injunction, those workers will continue to be excluded from a basic fair-labor protection, and the threshold will likely remain severely outdated under Trump’s anti-regulatory administration. Meanwhile, business groups like the National Retail Federation win. In court, industry groups argued the overtime rule would actually hurt some salaried workers who worked less than a standard workweek, or might “lose out on opportunities to expand their careers” because their bosses would opt to limit their managerial duties to save labor costs. 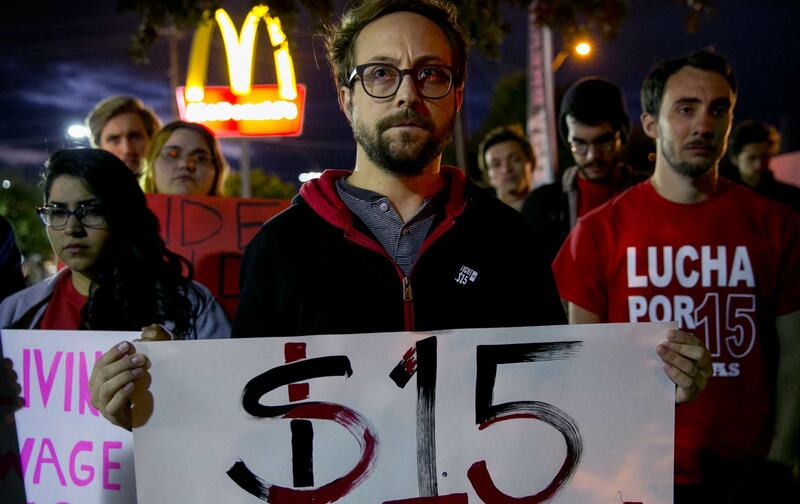 Trump’s pick for Labor Secretary, fast food impresario Andrew Puzder, has also reportedly assailed the overtime reform, along with efforts to raise the minimum wage. But the steady rise in the share of workers excluded from overtime shows that the existing threshold ignores both the structural inequalities ingrained in the present-day economy as well as the increasingly precarious nature of work, in which “white collar” professionals are simply wage-earning drones with a fancy title. Categorizing workers as managers is often not a way of delegating authority or promoting experienced workers but a loophole for avoiding overtime for glorified grocery shelving “supervisors.” Take the example of California Walmart worker Scott Wilson: In a 2014 NELP report, he recounted how, in his salaried position as an “Asset Protection Manager,” he helped coordinate and oversee store-security operations, but soon found his managerial responsibilities stretching into serving as a basic handyman, with workweeks stretching up to 70 hours. His “white collar” status automatically demoted the value of his blue-collar work. Judge Mazzant’s injunction further dims the prospects for any progressive labor reforms under Trump. But The New York Times reports that Trump is likely to seek to roll back overtime rules through the legislature, since the rule-making process can take as long as a year. In this sense time, at least, may be on the Obama administration’s side, because many employers, including Walmart, have already revamped their pay scales to comply with the overtime rule. In the meantime, Eisenbrey says that “employers will have to comply and workers will become familiar with and want to retain their new rights and pay.” Meanwhile, legislative action would hinge on whether the Democrats can block Republican deregulatory proposals. But with or without overtime expansion, worker organizing will be key for holding bosses accountable for commitments already made to managerial workers, through workplace organizing and legal challenges to misclassification by employers. Although Trump is poised to drive more aggressive labor rollbacks to labor protections with support from a Scrooge-ish Republican Congress, workers can still fight for fairer wage and schedules by campaigning at the workplace level. Whatever the fate of the overtime reform, the rank and file will still have to go into overdrive to defend a fair day’s work.